I’ve been to some nice backyard barbecues but I think I can now safely say that I attended “The Ultimate Barbecue and Dance Party”, while on a cruise no less. The party was held on the beautiful pool deck of the Seven Seas Explorer while on a 12 night cruise along the coast of France, Portugal and Spain. 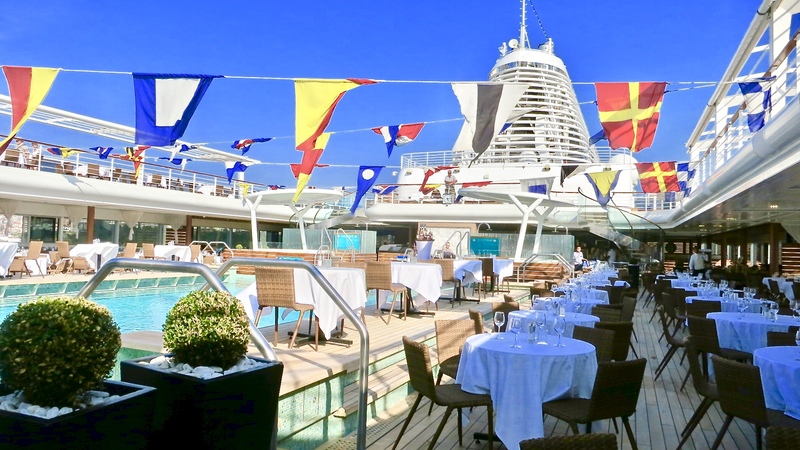 We had been onboard for 6 days and knew the ship offered wonderful menus in all of its restaurants and thought that a barbecue on the pool deck would be nice but we were not expecting to be amazed. My husband and I arrived a little early to have a cocktail at the pool bar, just as the finishing touches were being put into place. Colorful flags stretched above the deck, white table linens covered tables surrounding the pool and were laid with polished crystal and silver. Musicians were setting up their instruments and within hours after serving lunch, the crew had transformed the pool deck into a gorgeous outdoor restaurant. As people slowly gathered to find a table, Champagne, wine and cocktails were being offered. This was the scene for a very nice barbecue, very nice indeed. Click on any photo in the article to enlarge and see a slide show. I decided to stroll over to the Pool Grill and see what was going to be offered. On one side there was a fresh seafood buffet with chilled Alaskan King Crab legs, shrimp and mussels piled high on ice. A chef was grilling lobster tails and shrimp kebabs. This alone let me know that it was going to be a special party, actually very special. About this time my husband commented, “well if it was a really good barbecue, there would be a whole roasted pig”. Guess what, he was right. Just one thing though, there was not one but two whole roasted pigs just waiting to be pulled apart. Pulled pork, now we are talking about a real barbecue as far as this Texas girl is concerned. Of course that wasn’t all, there was more, much more. On the other side of the Pool Grill, cooked to order pasta and risotto was being prepared along with sautéed Mediterranean vegetables. In another area, there were sliced cured meats and over a dozen different, perfectly ripe, European cheeses, a large assortment of salads as well as fresh baked breads, cakes and pastries. Last but not least, there was an ice cream sundae bar with sauces and sprinkles. I have to take my foodie hat off to Senior Executive Chef Sean Emsile and his entire galley team for pulling off “the ultimate barbecue”. The highly skilled and imaginative chefs not only prepared the freshest of ingredients, they were prepared to perfection and beautifully presented. But wait, I did mention a dance party didn’t I. Yes, there was an orchestra and the ship’s production cast of singers and dancers, everything necessary to “Rock the Boat” as the dance party was being called. As the sun went down, the outdoor lights came on, the music went from mellow to hot and it was time to party. While I never felt the Explorer rocking that night, I can guarantee you that there was a lot of swinging and rocking happening on the pool deck. A cool breeze and a starry night sky was the “icing on the cake” so to speak. If you are ever invited to a party on the pool deck of the Seven Seas Explorer, make sure you go. If it is anything like the one we experienced, I know you will have a great time and you will be saying the same thing. It was the “ultimate barbecue and dance party” that you ever had the pleasure to attend. I thought that an evening barbecue outside on the pool deck would be nice event but was not expecting to be amazed with how nice it was. Have you ever gone to a barbecue and dance party that was memorable like this one? I’d love to hear about it. This entry was posted in food, lifestyle, photography, travel, Uncategorized and tagged outdoor barbecue, rock to boat dance party, seven seas explorer, ultimate barbecue, ultimate barbecue and dance party, ultimate bbq. Bookmark the permalink. That sounds like great fun and what fabulous food! Hi Kay, There wasn’t one thing served that wasn’t absolutely delicious. It was indeed Fatima, I wasn’t expecting the huge variety of food, especially the seafood. I was expecting steaks, burgers, etc. The chef and his team definitely know how to impress the guests. So very true Lea Ann, they definitely know how to throw a first class barbecue. We have been to some nice parties but this was certainly special. That is a different experience and it looks like you all had a great time. We did have a great time Jovina. I know that the people who decided not to go to the barbecue regretted it the next day when fellow passengers were raving about it. Now that looks like a beautiful party, the food looks exceptional! I would want to try a little of everything! It sounds like it was fun too, with everyone dancing and mingling (although, that couple looks a tad too close to the pool for my comfort!). It also looks like you had wonderful weather. This cruise line looks like a true winner, not like the average cruise for sure. Hi Eva, I did just like you said and took a tiny bit of quite a few items. The couple that you spoke of are members of the theater cast. They put on 4 or 5 different shows in the theater during our cruise. Several times they all lined the top edge of the pool and danced. And do you see those high heels…I would have ended up in the pool. 😀 You are right, it was definitely not your average cruise from what we have heard from other cruisers. We did have good weather, the best in years. Wow!! What fun. This sounds like a perfect cruise. Hi Darlene, There wasn’t one thing that we could find fault with. It was our first cruise and it was perfect…thank goodness! What a great barbecue and dance party! The best part? Someone else did all the work! I’m loving these posts from your cruise! Looks like a lot of fun with a lot of good food. I love dancing but my husband doesn’t. Oh well! That whole roasted pig looks amazing. Hi Gary, I think the roasted pig was one of the passengers favorites as it disappeared quickly. I love the look of a whole roasted pig. All that crackling and soft tender fatty meat…Mmmm…my mouth drools just thinking about it. That looks amazing – how exciting! I most definitely would have! Hi Diane, It is terrible when you plan a wonderful trip and it is ruined because of not being well. Thankfully, we were both healthy and happy aboard our cruise. This is amazing! I love when other people do the work and I can just enjoy the party (lol)! I absolutely love the roasted pig! And the rest of the food is so colorful! Hi Kendra, Thank you for stopping by for a visit and your nice comment. The party was great and the food delicious. *smile* To put it into somewhat ‘commercial’ terms . . . sailing on the ‘Seven Seas Explorer’ may not be the most cost effective way of travelling, but don’t you get your money’s worth! Delightful choice of beautiful foods . . . I would not have had time to dance and I love it !!! So very true Eha. Was it worth it, yes…as you say, you do get your money’s worth on the Explorer. The crew go out of their way to give you a memorable cruise experience. 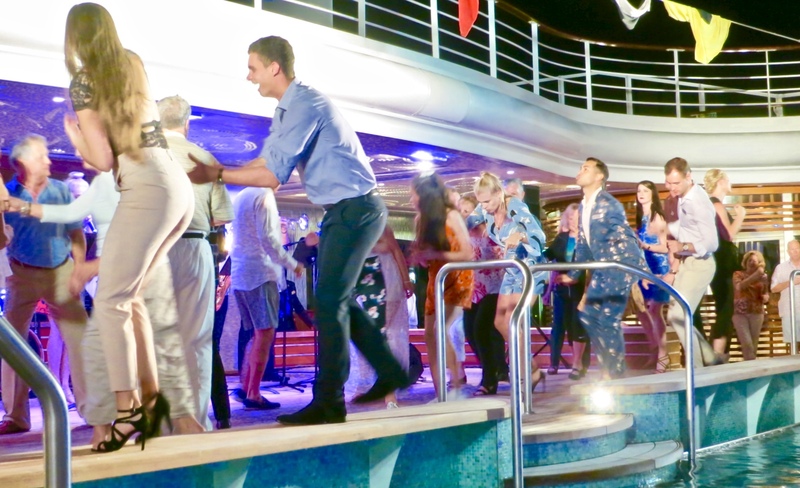 I never considered going to a dance party on a cruise ship! And I would so be there for all of the barbecue. Hi Lorraine, The dance party out on the pool deck, along with that barbecue was a wonderful surprise. I’m sure that the people that decided to eat in the main dining room that night must have had regrets the next day as the party was the talk among all the guests who enjoyed the party and food. Fun and with lots of great food…What a party! Hi Angie, It was certainly the best barbecue I’ve been to. Everything looks amazing. 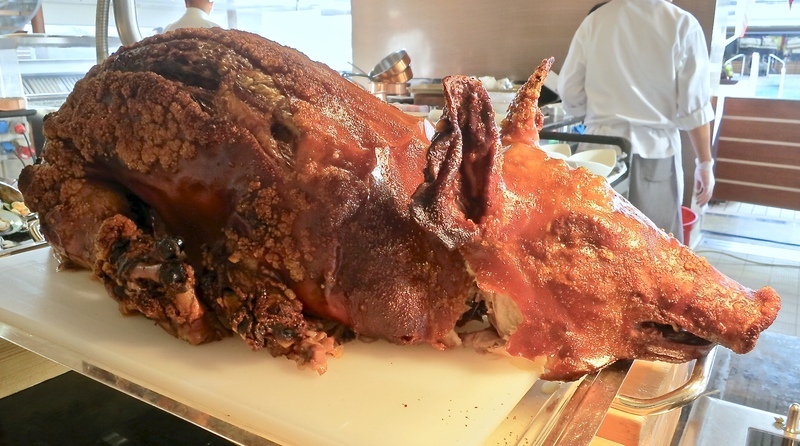 And the whole pig–most impressive! Hi Inger, All the food was terrific, especially the roasted pig. What fun, you lost me at that fantastic cold seafood bar, I can eat pork anytime. Did the girl with the high heels end up in the pool? Hi Greg, Our whole experience aboard the Explorer was way beyond what we imagined it would be. The funny part was that we were hesitant about the trip until our first day on ship…it was much more than we had hoped for. Hi Karen! What a party and what a spread. I am absolutely amazed at the whole roasted pigs!!! How could they pull this off on a cruise boat? Just incredible. Hope I get to experience a party like this one day. Great pictures and an amazing celebration! Thank you Allie, for your nice compliment. I would have loved to have seen the kitchen during the preparation for the party. I don’t know if you noticed how many chefs were lined up to be recognized for their contributions for this event, it was a lot. Looks like a fun and tasty evening on the ship! Hi Valentina, There was definitely a lot of food. When I think of a barbecue, I think of burgers and steaks…this party certainly took that to another level. Karen, the food looks amazing and my what a fun party! I would not have expected pasta, risotto, and lobster at a barbecue, but I would have certainly indulged! Hi Pam, We weren’t expecting all those amazing dishes at a barbecue either…it was great. I’ve been to a fair amount of barbecues in my life, but never one to come close to this. It definitely rocked the boat. Wow! All of that amazing looking food! It sounds like it was a wonderful evening. What! That banquet looks like heaven! So much food. I particularly love shellfish but everything looks fab. You must have had a great time. Hi Alida, We did have a great time. Good food, good entertainment and dancing, what more could we have asked for. As a pesco-veggie, I’ve never been a huge fan of BBQs but the dessert trolley is the thing of dreams! Looks like you all had a blast! Hi Scarlett, You would have had plenty to eat at the barbecue. As a matter of fact, your diet wouldn’t have been a problem at any of the restaurants on board the Explorer. And the desserts, they were delicious. A couple of the dancers look like they’re dangerously close to falling in the pool! This has got to be the most extravagant barbeque that I’ve ever seen! I would’ve eaten so much, that I would’ve needed the dance in order to work some of it off. Hi Jeff, the dancers on the pool edge were all professionals. It amazed me that they could all dance on the edge and not fall in. It really was an extravagant barbecue…I’ve never been to one so nice. “It’s a Wonderful Life” with James Stewart and Donna Reed – an old Christmas classic. They fell into the pool and the rest joined them. Your post sure reminded me of this famous movie! Hi Judi, I think everyone thought the dancers, especially the girls in the high heels, had to fall into the pool but not one did. They were part of the production cast that performed in the theater during the cruise and they are very talented. What an amazing party!! I would have eaten way too much! Hi Lisa, It was hard to not try a little bit of everything, it was all so good. The food on the cruise looks incredible. Hi Sheryl, The food at the barbecue as well as in all the restaurants on the ship was terrific. Hi Tandy, Oh yes, we’ve had some great pork in Italy as well…porchetta comes to mind. Hi David, That is exactly what I thought when I went around at looked at all the food they were serving at the barbecue…the best I’d ever seen. Omigosh, talk about the unexpected but what a boot scooting’ hoot! Oh my Texas friend, it really was a hoot…a boot scooting hoot at that. 😀 The only thing that could have been better is if you and Pete could have joined us. What a fun party Karen…and the food look amazing…thanks for sharing the pictures…enjoy your week and Happy Thanksgiving! Thank you Juliana for your nice compliment and wish, I’m happy you enjoyed the photos. We did have a nice Thanksgiving, I hope you did as well. You have the life Karen!!! And what a food spread! There’s nothing better than a BBQ and dance party on a boat too. Hi Karrie, I must agree with you, I’m a very lucky person. The cruise, the barbecue and the party were all amazing. Thank you Rhonda, I’m so happy you enjoy tagging along on our travel adventures. This indeed was a wonderful trip…we had no idea how much we would enjoy the whole experience. Wow! It looks like it was a great cruise. The food looks very impressive. Karen, Happy Thanksgiving! Thank you for your wish Dawn, we had a lovely Thanksgiving with our family…I hope you did as well. We loved everything about this cruise, far better than we thought it would be. What a beautiful trip! All those pictures of food make me hungry. I had that kind of whole roasted pig once, it was amazing, I kept going back for more and was not even tempted to try anything else that was offered that evening. Hi Adina, You would have really enjoyed the roasted pig, it certainly did disappear quickly. This does indeed look like a fantastic party. I’m glad you enjoyed it. The edible bouquet with the oranges caught my eye, so beautifully done. Hi Amalia, Wasn’t the edible bouquet pretty…I just had to take a photo of it. Wow, with all that amazing food I would have had a hard deciding where to start. But I would have probably started at the seafood grill and worked through to each station for at least a nibble! That definitely looks like an unforgettable party, Karen! Sounds like a wonderful time! And the food . . . well my taste buds would be overjoyed wanting a taste of everything. What a lovely spread and so beautifully displayed. He Jan, The food really was displayed pretty, every detail was perfect. Wow, that’s quite the barbecue party! Always an adventure to follow along on your travels. Thank you Marlene, I’m happy that you enjoy following along on our travels…the barbecue and dance party was so much fun. That they do John, It was the best barbecue I’ve been to and the dance party was so much fun. Did they have one one your cruise…I know they are dependent on the weather. I agree with Jeff the Chef- the dancers look like they are ready to fall in the pool! I especially like the floral arrangement made with fresh fruit and the combination macarons/profiteroles dessert! Merry Christmas to you!